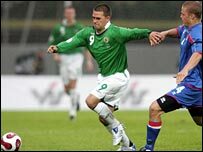 A Keith Gillespie own goal a minute from time condemned Northern Ireland to a devastating defeat in this Euro 2008 qualifier in wet and windy Reykjavik. Armann Smari Bjornnson fired into the roof of the net to give Iceland a sixth minute lead. Northern Ireland bossed possession and Chris Brunt hit the crossbar before David Healy scored a deserved equaliser from the penalty spot on 72nd minutes. But Gillespie turned the ball into his own net in an agonising finish. Northern Ireland boss Nigel Worthington made two changes from Saturday's 1-0 defeat in Latvia with Brunt replacing Stuart Elliott in left midfield and striker Warren Feeney coming in for Kyle Lafferty. And it was Feeney who provided the first goalmouth action with Arni Gautur Arason pushing clear the Cardiff player's fierce shot in the opening minute. Iceland took the lead with their first attack - a long ball sailed over the visitor's defence and Bjornsson provided the cool finish from Gunnar Heidar Thorvaldsson's intelligent cut-back. Bjornsson was booked for a late challenge on Jonny Evans on 19 minutes. Northern Ireland began to convert their superior possession into chances midway through the half. Three opportunities came in six minutes, starting with Sammy Clingan curling his 18-yard effort just wide. Arason's poor fisted clearance presented Evans with an open goal but the Manchester United defender fired over. An Evans header three minutes later was goalbound but the ball flicked off a defender's head and flew over. Feeney fouled Arason as the keeper cleared just before the break and the resulting yellow card means he is banned for the trip to Sweden next month. Brunt was denied by the woodwork just minutes after the restart when he blistering strike from 30 yards smashed against the bar. Iceland had produced nothing in attack since scoring so it was no surprise to see Barcelona striker Eidur Gudjohnsen enter the fray after 53 minutes with Bjornsson making way. Northern Ireland began to step up the pressure but Healy and Brunt both failed to make the most of free-kicks in good positions. Michael Duff found the ball at his feet from a corner but only managed to poke the ball straight at Arason. The visitor's finally made the breakthrough when Healy picked himself up after being brought by Kari Arnason to dispatch his penalty into the corner of the net. Worthington brought on Grant McCann and Steve Jones late in the game as his team chased a winner. N Ireland skipper Chris Baird will also miss the Stockholm qualifier after being yellow carded for a heavy challenge. A point was the least N Ireland deserved but with just 60 seconds left Gillespie diverted Gretar Steinson's low cross into the net from six yards. Worthington's team would have gone top with a victory but they are three points behind Spain and leaders Sweden, who have a game in hand. Iceland: Arason, Kristjan Orn Sigurdsson, Ragnar Sigurdsson, Ingimarsson, Hreidarsson, Arnason, Vidarsson, Steinsson, Hallfredsson, Thorvaldsson, Bjornsson. Northern Ireland: Taylor, Baird, Duff, Evans, McCartney, Gillespie, Clingan, Davis, Brunt, Healy, Feeney.